With its brightly coloured houses and buildings, Scottish Gaelic ˜Tobar Mhoire’ is the home to whisky, Balamory, Highland games and wildlife excursions. Arguably one of Terry Harrison’s more bright and colourful paintings, Tobermory’s vibrant houses are reflected in the rippling water as the boats bob gently in the harbour. 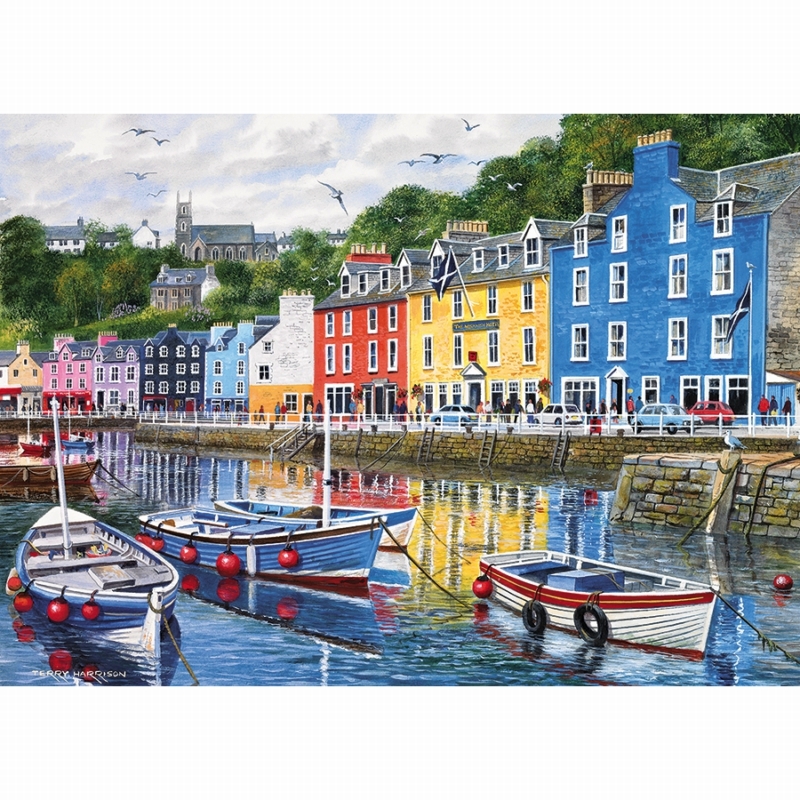 Tobermory is the capital of, and the only burgh on, the Isle of Mull in the Scottish Inner Hebrides. It is located in the northeastern part of the island, near the northern entrance of the Sound of Mull. Legend has it that the wreck of a Spanish galleon, laden with gold, lies somewhere in the mud at the bottom of Tobermory Bay although the ship’s true identity, and cargo, are in dispute. By some accounts, the Florencia is a member of the defeated Spanish Armada. Fleeing the English fleet in 1588, it anchored in Tobermory to take on provisions. Following a dispute over payment, the ship caught fire and the gunpowder magazine exploded, sinking the vessel. In her hold, reputedly, was £300,000 in gold bullion, however no significant treasure has ever been recovered in Tobermory Bay. As with all Gibsons jigsaws, the beautifully illustrated pieces are made from the highest quality 100% recycled board and are therefore a pleasure to work with again and again. Details: High quality 1000 piece jigsaw puzzle. Puzzle size 48x68cm when complete. Made from thick, durable puzzle board that is 100% recycled.